Last month, I signed up for the Plush You! 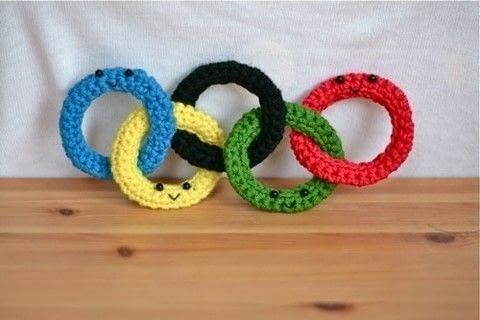 Schmancy Olympic Challenge and got assigned “Opening Ceremonies” for my plush-creating. And what do you know, I went with something crocheted and smiley. Oddly enough, I have not watched any Olympic coverage yet, and I just finished designing these…at the tail end of the games! Ah well. 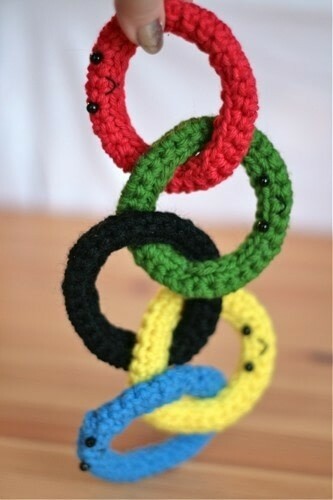 Below is the pattern for these Olympic rings. Repeat between * * 2 more times. Sc across and finish off, leaving a 12-inch tail. With tapestry needle, stitch together the free loops (first row) to the inner loops of the last row, stuffing with a small amount of fiberfil as you go. When you have done this for all five rings, arrange the rings using the top picture for guidance or check out this Wikipedia image to see how they should join together. One by one, stitch each ring closed as you wrap it around the correct ring. Stitch to the back of the ring it’s touching if it lies underneath, or to the front of the ring if it lies on top. (Does that make sense?) While they won’t stand on their own, the rings will stay in place if leaned against something. Sew on the beads for eyes and embroider the mouth on all of the rings except the black.